No-one has yet admitted responsibility for the blast. What happened at the hall? Some 1,000 people were said to be in the complex at the time of the explosion. Basir Mujahid, a spokesman for Kabul police, said that "Islamic scholars and their followers had gathered to recite verses from the holy Koran to observe the Eid Milad-un-Nabi festival". The suicide bomber gained entry and headed for the centre of the gathering, where he detonated his explosives. Religious studies lecturer Mohammad Hanif said there was a deafening explosion and "everyone in the halls was screaming for help". Images from the scene showed ripped and blood-stained clothes, broken glass and overturned furniture. 1TV News quoted the health ministry as saying that 24 of the wounded were severely injured. President Ashraf Ghani condemned the "terrorist attack". He declared Wednesday a day of national mourning, with the flag to be flown at half mast. Pakistani Prime Minister Imran Khan condemned the "cowardly act of terrorism" and sent his condolences to the bereaved families. Who could have been responsible? 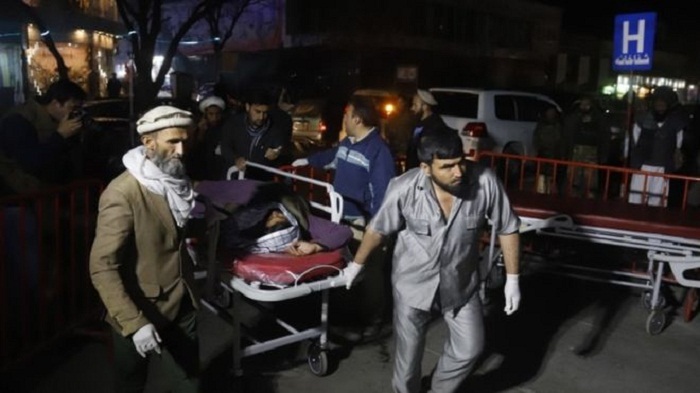 The Islamic State in Afghanistan group, sometimes known as Islamic State Khorasan, has claimed responsibility for most of the recent deadly attacks of this kind. It said it was behind two attacks in Kabul in August that killed dozens of people. Dozens of people were also killed across the country as voters cast ballots in the nation's parliamentary elections in October. The Taliban have also continued attacks, although many of them target security forces. A Taliban spokesman, Zabiullah Mujeed, has denied the group had any involvement in Tuesday's attack. Are there moves to end the violence? There are some with the Taliban. This month, Taliban militants for the first time attended an international meeting, hosted by Russia, to discuss ending the decades-long conflict. The US special envoy for Afghanistan has also been meeting Taliban officials in Qatar, but no agreement has so far been reached. The Islamic State group is another matter. Opposed by the Taliban and considered a major threat by Western powers, the Sunni militants aim to turn the conflict in Afghanistan into a sectarian war with Shias, who they consider apostates. The violence is not easing. Civilian deaths and injuries have hit record highs. Casualty figures for the conflict, which began in 2001, are the highest since the UN started keeping records in 2009.